Trout is probably the most widely available fish on restaurant menus. It is farmed widely in the mountains from the Alps down along the Apennines. Some riverside restaurants have pens and the fish are pulled out of the pen when they are needed. 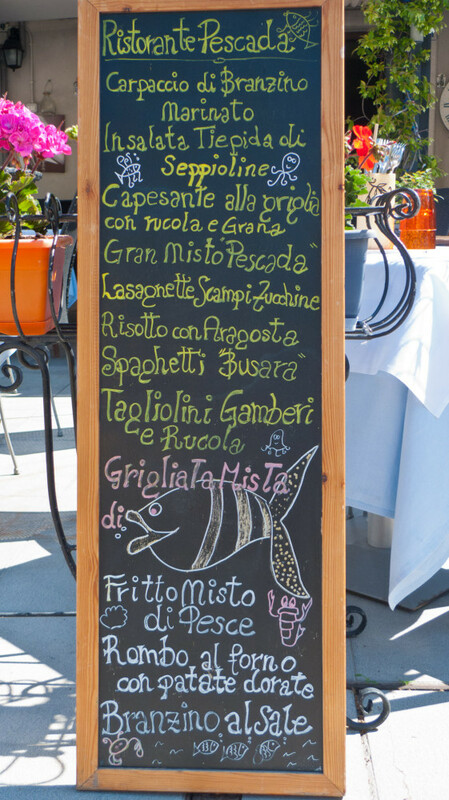 I haven’t counted, but Italy must have hundreds of lakes and fresh­water fish are a common sight in lakeside restaurants. Persico (perch) is probably the most common, with tenca (tench) and carpa (carp). I’ve also read that catfish (pesce gatto) is a speci­ality along the Po. Eels are a local speci­ality in the Po Delta. Unfortunately the european eel is a critically-endangered species - no one is sure of the exactly why, but the numbers reaching Europe have been in drastic decline probably as a result of a combin­ation of over-fishing, parasites, and other threats. The breeding cycle of the european eel is one of the great wonders of nature so it would be tragic if it were to disappear. In particular avoid the baby eels. Eel life history - Wikipedia. Puglia is the heartland for production and consumption of mussels (although the Veneto is catching up). People have been farming mussels off the coast of Taranto for thousands of years, and it’s common to see kiosks that sell only cozze (mussels). As well as the familiar mussels you can also find cozze pelose. Hairy mussels which, as the name suggests, have shells with a sort of brown fur. 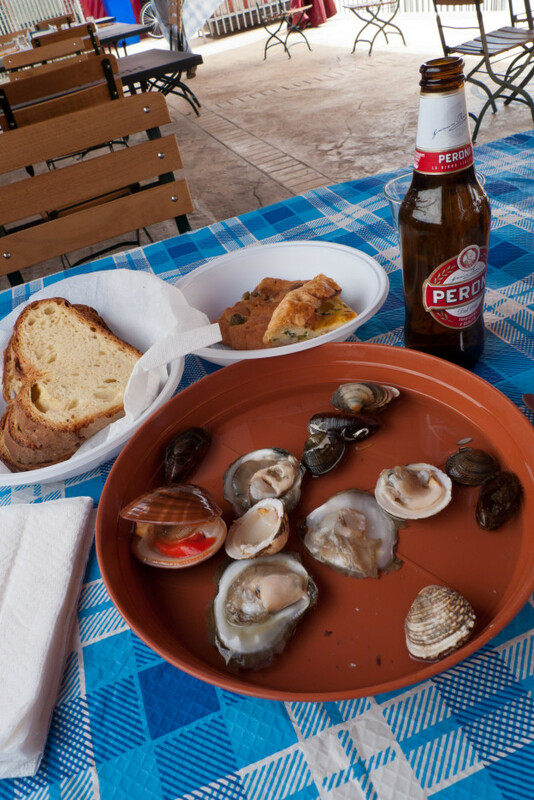 Another seafood speci­ality on the Puglian coast are ricci (short for riccio di mare - sea urchin). I don’t know whether these are one of those foods that require you to expend more energy eating than they actually provide, but certainly I’d file them under ‘too much faffing about’. Baccalà (baccalhau - saltfish) used to be a staple of Italian cooking, and is still pretty common. Baccalà fritto (cod deep-fried in batter) is a speci­ality in Roma and I've also come across something similar in Emilia-Romagna. Close your eyes and you could be eating fish and chips - only without the chips. Bacalà vicentina is a speci­ality of Vicenza - and there’s even a confra­ternita dedicated to promoting and protecting. (A note for food geeks: bacalà is the name vicentini give to stockfish - which is dried fish - and not the same as baccalhau/​baccalà). Spaghetti con le vongole (clams) - is a classic dish that is widely available and one of the handful of dishes that you might find in any part of Italy. If you like your seafood then look out for zuppa di pesce mussels, prawns, calamari, octopus all cooked in a tomato sauce (often with a few chillies). porchetta. Young pig spit-roasted with herbs and served in a panino. 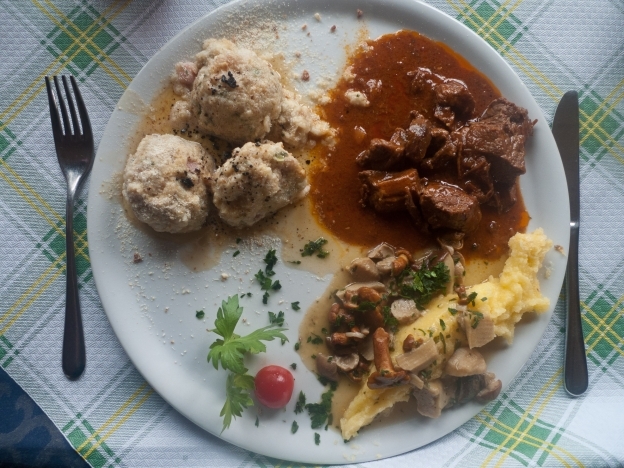 A classic dish in central Italy. Salumi - cured and cooked meats and sausages are a universal part of Italian cuisine. Fridges are a relat­ively recent invention and the ability to preserve every part of the family’s pig was an important part of survival. Pig s were slaughtered in early-autumn and then every bit cured or turned into sausages and eked out for the rest of the year. 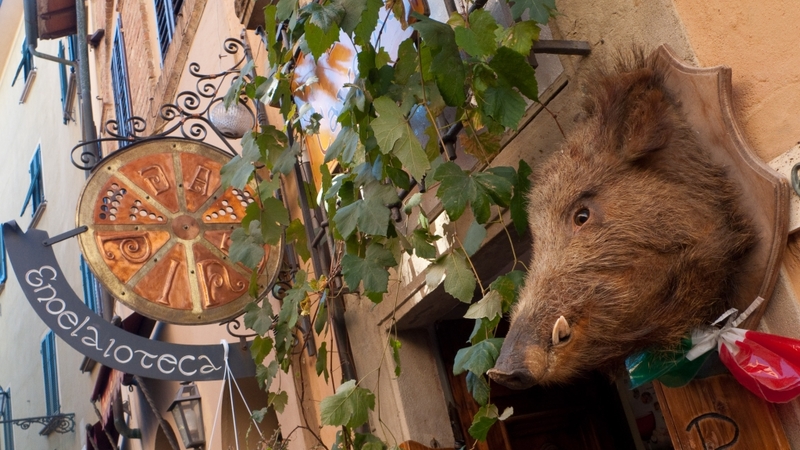 Parma is known as the major centre for prosciutto, but there are many locally-cured variants. In particular, the prosciutto produced in San Daniele in Friuli Venezia Giulia has a distinctive and sweeter taste. speck - from the Südtirol and Dolomites. Is ham that is cured and then smoked over a three-month period. Juniper beans are used in the curing process and juniper branches are used in the smoking process.